Pines Harbor Realty Exclusive. Big, bold and beautiful. 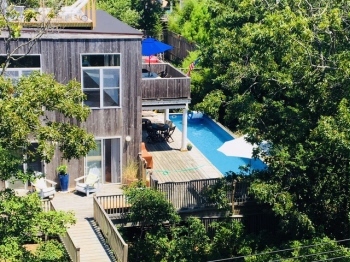 Classic Fire Island Pines house designed by a notable architect. Large open living and dining room with high ceilings, windows on all four sides and a wood burning fire place. Gourmet kitchen with windows on three sides has top of the line appliances plus a large separate butlers pantry. 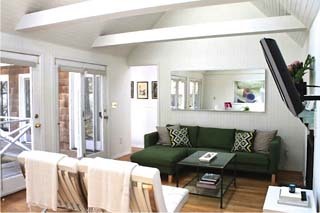 Fantastic two-room master suite for those who want a private office or den. Three additional large bedrooms share three full baths. 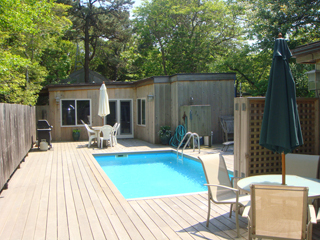 Huge sunny pool deck complete with hot tub and outdoor shower. Open air, screened-in lanai off the pool. Small gym. Newly installed HVAC system for heat and air-conditioning throughout. All new. Renovated four bedroom house with spacious common area. All new kitchen with new appliances. 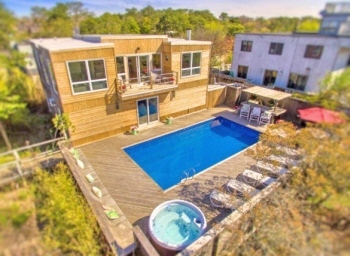 Has lovely pool deck with big out door shower, open kitchen, larger bedrooms, airy, bright, nestled in the foliage of fire island. This is a great share house. It has four large air conditioned bedrooms and four bathrooms. You walk up to a pool that gets sun all day. Separate deck that has an extra large hot tub. 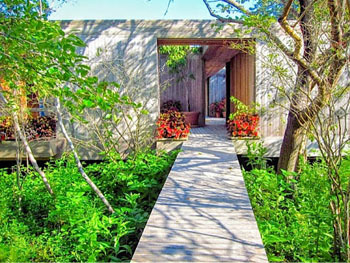 Multiple decks that surround the house and plenty of outdoor space that includes a large outdoor shower. Fantastic four bedroom house with all the luxuries. All bedrooms have A/C and their own private bath. Second floor living room combined with the dinning room and kitchen. Great for entertaining. 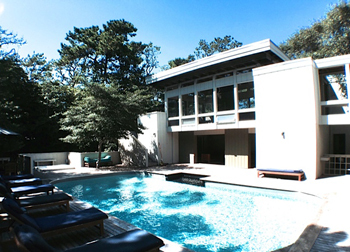 Fantastic pool and hot tub area complete with outdoor shower and wet bar. This house is great.